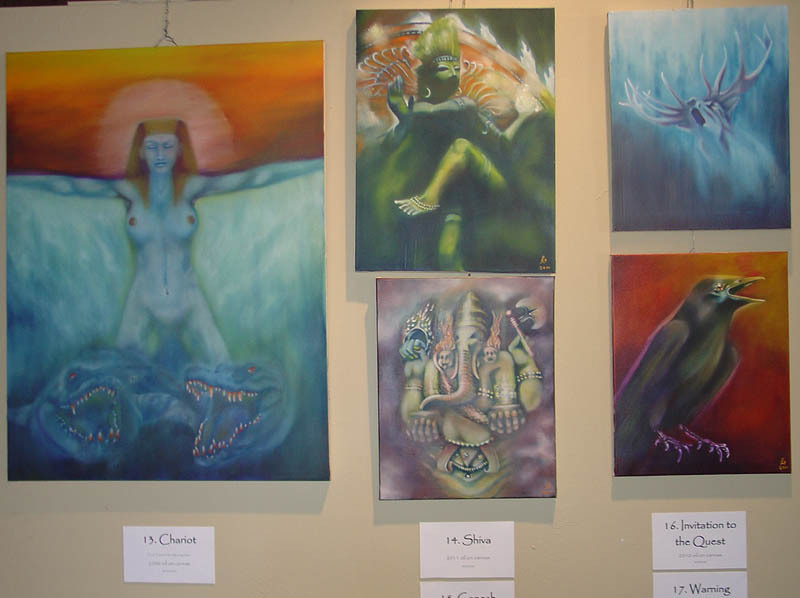 Roger Williamson of Magus Books and Herbs has a one person art show of his paintings entitled, “God Factory” , Mystery IS Energy… but what does that mean? opening this weekend at The Nicollet. Comets-ov-Cupid and Jealous Jester will offer live music for the opening reception 7pm Saturday, October 8. The Nicollet is a spacious relaxed space with fine coffee and food at the NE corner of Franklin and Nicollet Avenues in Minneapolis. I talked to Roger about his art. I used to paint way back in school in Coventry, England. Later my father was helping to get me back on the straight, and signed me up for art school in the town we lived. He dropped me there the first day. I wasn’t very impressed with it. For the next six weeks he dropped me there each morning. I would walk in the front door, down the corridor and walk out the side door. He finally got a letter asking where I was… and he asked me where the Hell I had been. I really was in love with rock and roll, so I had spent my time in the south railroad coffee bar. It was the first time I had heard Bo Diddley, and I can still remember that experience. In those days you could go to college free in England. At that time I was totally preoccupied with music, and that continued until my thirties. I was writing a book and I needed an image of the Lovers tarot card. I had never been happy with the images that were available. My art started from there. 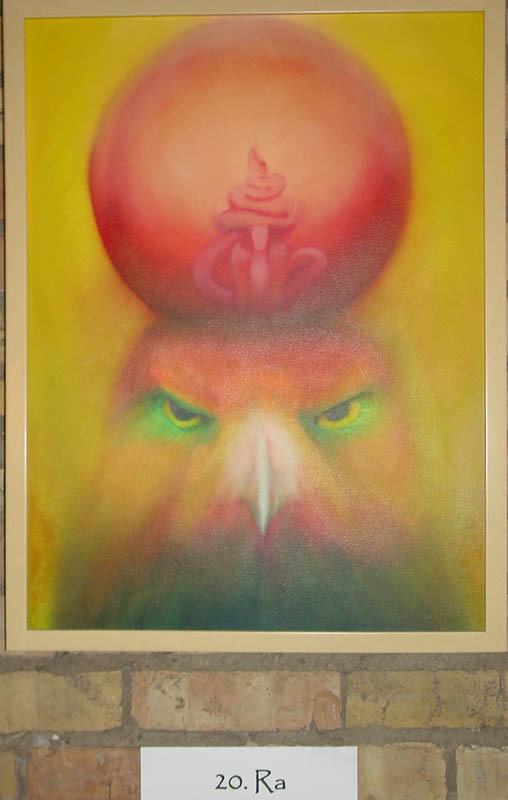 I was working in pastels then and did a series on the Enochian workings on the Earth Tablet. I did some automatic drawings about these experiences. It was like this floodgate opened, I couldn’t stop just churning out these pictures. It was almost like an exorcism. This started about thirteen years ago when I really started. It was such a shock when I would get one of these pastels framed, it was so expensive. I switched to oil so when I got one done I could just pound a nail in the wall and hang it up. I transferred my pastel technique to oil and then worked from there. Do you use symbolism and magical references in your work? I am a great believer that the world we live in is a magical place, you don’t have to go somewhere else to have magical experiences. 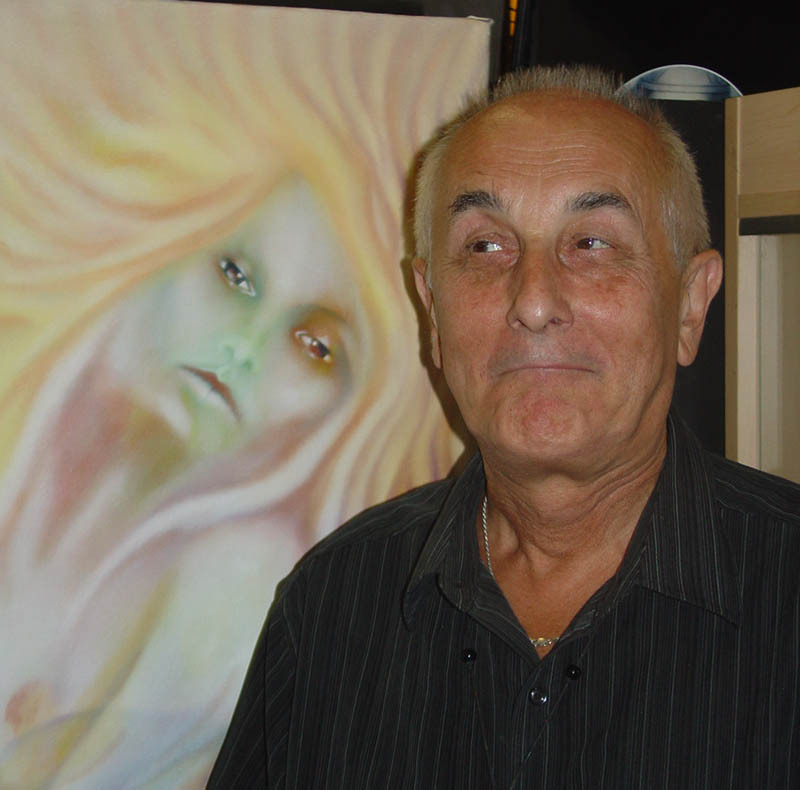 It is a fantastic universe, I feel that I try to demonstrate what a magical place it is with my art. Like the Odyssey, here we have this great tale and yet we really all live the Odyssey. A young man, ripped away from his roots and sent across the world to go fight a war. Very much as we are often ripped from our homes environment to go to work. Then we spend the rest of our lives trying to get back to where we started. Our world is very magical if we choose to look at it that way. Do you see your artwork as reflecting the ‘real’ world? I live in that world. I do my painting for myself, for the enjoyment. It releases something out. The artist is like the oyster. The oyster is irritated by a grain of sand, and we are the same. Hopefully we create a pearl from that. Artists are by and large irritated people. Our lives are like a Mandala, and we do things to enrich our lives. It is like believing in God Spirits. People can say, “It is obviously not true!” The truth is not the point, the points is that our lives can be enriched by the idea of God Spirits. It is important that we live enriched lives and not just do everything to make money, to survive. Do you plan out each piece or sit down to a canvas and start? I generally have a rough idea of what I am after. Sometimes an idea will just pop in as I am working. Sometimes it is based on a story, say Orpheus, what is that story trying to tell us? I usually have a few sketches, but a lot of it is worked out on the canvas. I start with getting some paint on the canvas and then look at it and ask, “What is trying to come out?”. That way it is a little more organic. It is when you “try” to paint that things look stiff. When you see images come out of all these swirls and meanderings it seems more natural. That a joke? Well I guess it is one on paper. When I was a musician that was it, it was all about the life style. The whole drama of it was what I loved. It is not a choice. You are driven to create something, you do it because you create; music, poetry, painting. It is just something you have to do. If you can make money at it, well and good. That certainly isn’t the driving force. I love people to enjoy the paintings, and especially if they enjoy them enough to buy them. Really, I am just driven to do it. As the images here represent, this is a large selection of some of Roger’s most powerful work. If you can’t make the reception, please stop in and see the work. 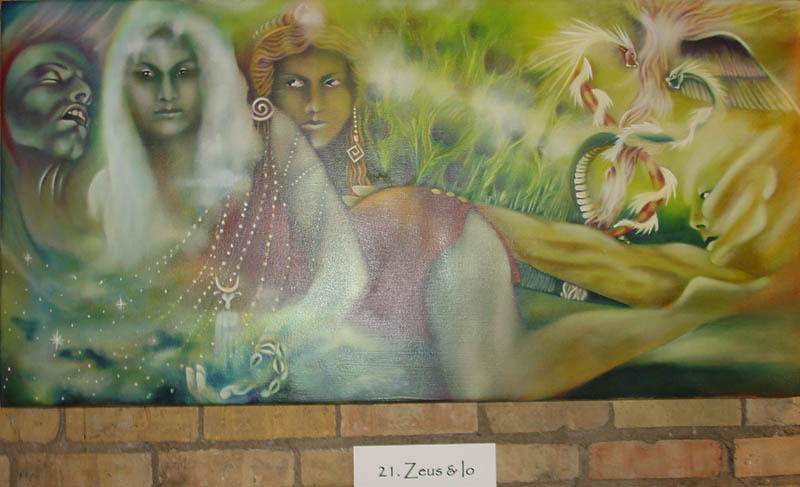 Most Pagans will find pieces that particularly resonate with their beliefs. Live music and opening reception 7pm Saturday, October 8th at The Nicollet The exhibit will remain on exhibit through November.